Image of the Week #21: "The Problem of the Near East"
An article from the Wellesley News, the student newspaper of Wellesley College, from the late 1910s. 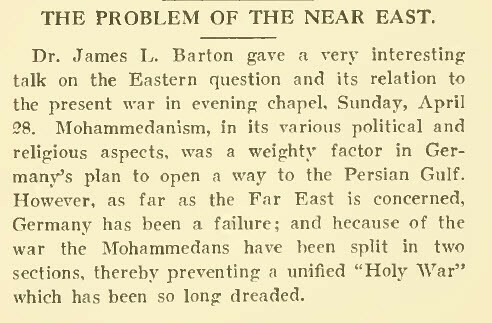 It doesn't entirely surprise me that nearly 100 years later and we are still incapable of respectfully or usefully discussing the politics and religions of the "Near East." I'm curious if "Mohammedanism" was a generally used term by the West at this time and curious to know what kinds of images this evoked in the common person and of course, what Muslims made of this term. This story ran about six years before The Thief of Bagdad (1924) and that makes me wonder what were the contemporary images of Muslims in the 1910s. The West's fear of the "Holy War" seems to be something that still dominates many individuals' abilities to understand and meaningfully interact with followers of Islam. But to know that this misconception has been ongoing for generations reminds me of how hard it is for people to break through their learned and cultural biases.